I have a cold. I really need to honor this cold. Do you ever get to that point? I keep going, but in the end I realize I have to make space for the cold. Even if I stop, I don't mentally stop. That's hard to do. Lots of lemon and ginger drinks yesterday have helped. I want to avoid a cough. Things tend to get louder until they get our attention sometimes. It all began with the three layers of rather yucky and damp carpet I pulled up from my conservatory a few days ago. I did stop and go and get a mask! I had no idea how bad it was until I starting peering underneath the layers. I did consider pushing all back down again. I even pulled up my wicker chair and sat there staring it for ages. Wondering what to do. Slowly realizing that the only way forwards from this point was it had to come out. All of it. There and then. By me. I just couldn't pretend it wasn't there, now I had seen it. It was a lot of carpet, I had to cut it up and heave it around. It was a mad push of energy. Three layers of damp carpet out of our life has to be a good thing. Up until that point, I had been holding back. 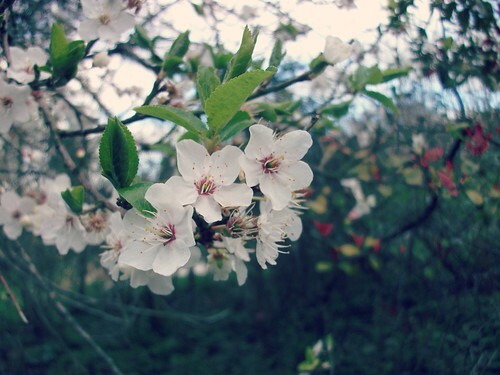 I try to look after my energy in the spring. So many ideas start to bubble. Tiling in the kitchen. Lets sort out those annoying bits in the bathroom. Chalk paint on the table perhaps? a bench to paint maybe. Or the big decision to clean the cooker.....it's reached that point. Our whole food thing needs new inspiration. I would be embarassed to tell you just how far we have fallen. But having a cooker that looks like something exploaded in it can't help. I need to have a bless the cooker ceremony! I hope we can find our way to new connection with food. Going for little carries with little dog has been a great work out for my arms, but they are feeling pretty sore now. She is tottering around. I feel like I'm trying to hold up a few difficult fronts all at once. I know this is life sometimes. I really appreciate any support I get. 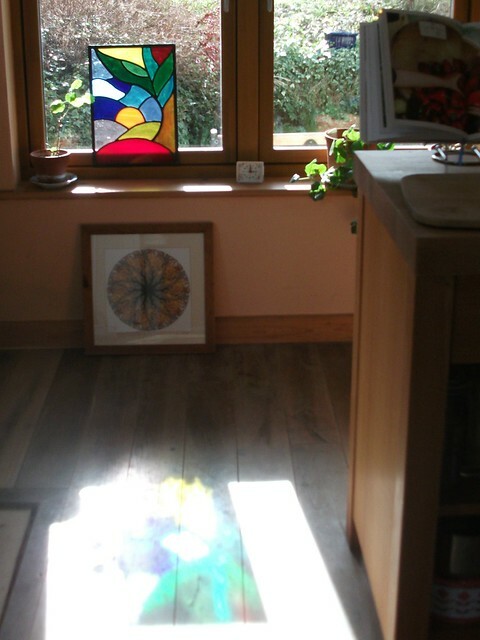 Indoors I have moved my glass panel to the front so the light can shine through. I am a big fan of coloured glass. 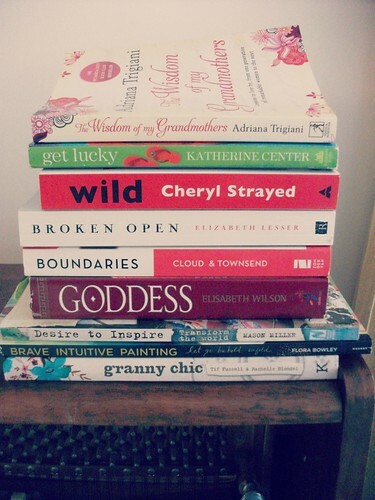 I snapped my reading pile to show you. It's actually grown by several more. I need to go to bed a little earlier so I have time to read. There are some great books here. Most of them found by reccommendations from around the web. In fact after reading the first chapter of most before buying I feel as though I am reading many books at once. I am just finishing The wisdom of my grandmothers. This has felt very appropriate after all the sorting and reconnecting I have doing with my family photos and belongings. It's been quite a time here lately. 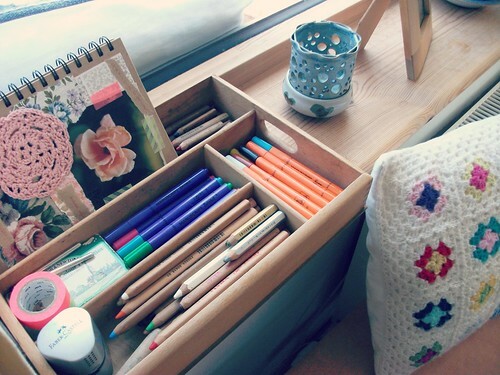 I have sorted my pens and pencils, a little box of water colour, my journal. They are ready should the mood strike me for a little bit of colour and words. Have you seen this blog about journalling? 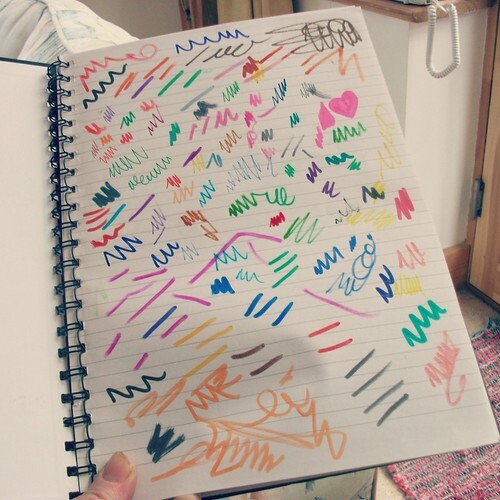 I have only managed to test my pens so far! 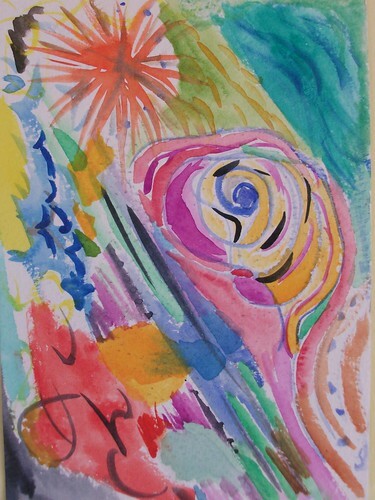 but I did find this water colour postcard experiment from along time ago. I put it on the wall. It's very 80's don't you think?! 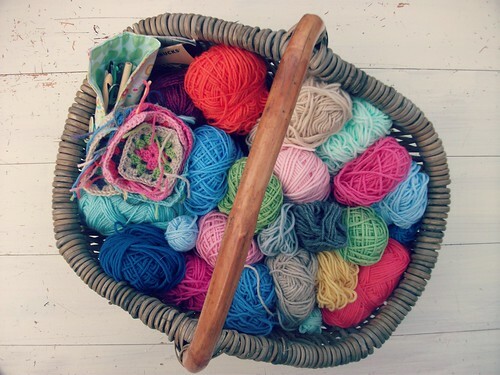 The wool basket has been calling me. My arms have felt a bit too sore to crochet with lately. But I forced myself last night! Whilst watching some film I can't remember the name of. Sometimes you just need to sit down and crochet. Unknown object. Colours seem a bit spring like. A possible pan holder for the kitchen at this point! 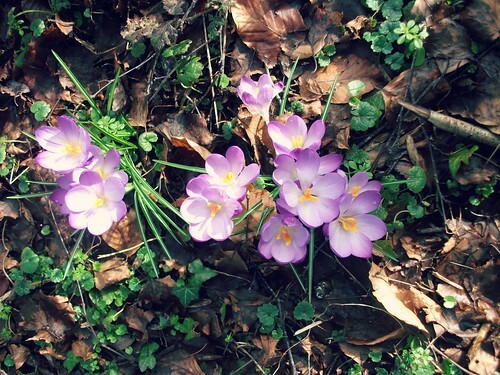 And today is sunny, in fact the weekend is I think, here this spring. So have a warm, creative and restful weekend won't you. I hope you feel better soon. I love your unknown object. The colors are beautiful. Sometimes it's just the thing to make. 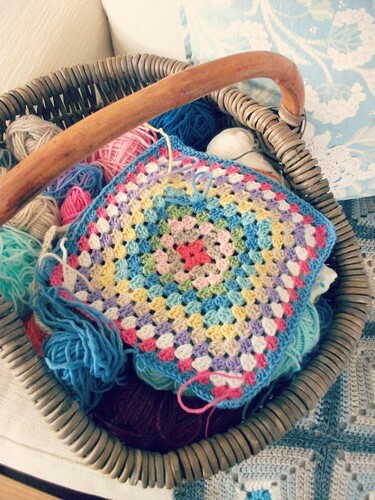 I love the colours of the unknown object, it would make a lovely throw for an outside chair. 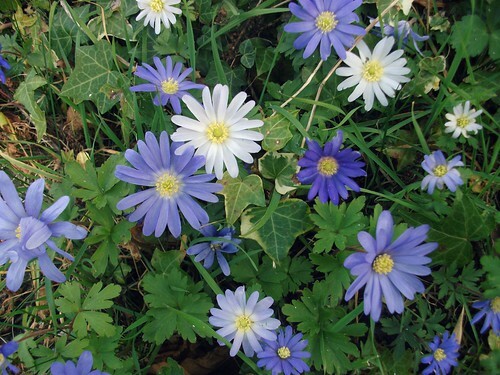 What is it about spring that makes us want to tidy ? Like you I have so many project running round in my head, started on the kitchen yesterday, windows cleaned so i can see into the garden which I tidied on Friday....planed what I'm doing over Easter when I have time of work...the list goes on and on....have not crochet for ages, love your little squar, might have to do some to night..
Just catching up here Heather ... my blog reading 'pile' is taller than your book reading pile, so tall it's in danger of falling over! I do hope you are feeling better soon, and that Little Dog heals quickly. When we had a dachsie recovering from a back op some years ago I carried him around in a big shawl-like baby sling ... would that save your arms a bit or is Little Dog not little enough for that?